"I am Denesuline, or Dene, and a member of Athabasca Chipewyan First Nation (ACFN). The word Dene, when translated, is broken down into two words: De meaning flow and Ne meaning Mother Earth. This encompasses an understanding that we as Dene people flow from Mother Earth and we are a people of the Creator and Creation. So our very identity is inextricably linked to the land. It is here that we see some of the most direct and adverse impacts of climate change." "How far back in your family history do you have to go to find someone who made a living working the land? The chances are you will find it difficult unless you are from a farming family. Our disconnection from the land goes back many generations and we are still feeling the repercussions today." "By now, the slogany neologism already represents much and on many levels. Perhaps, for the PM, Brexit means leaving the EU and nothing more. Pundits counter that Brexit has revealed a previously ‘hidden’ and polarising dynamic in British society—immigration. But the underlying causes of attitudes around immigration, as well as predictors of the leave vote, have more to do with deprivations of income, employment opportunity, and education." "On a hot day in the foothills of the Cevennes, the mountainous area in southwest France where I live, I’m spreading a mixture of bone meal, dried blood, crushed oyster shells, and wood fire ash onto a mound of wood, twigs, leaves, and straw—a powdery mix of minerals and biological activators. Although it takes six of us a day to build one Cevenol mound, our teacher, Robert Morez, assures us our efforts are worthwhile. The mixture will supply nutrients to plants, and retain water effectively, for at least four years." "Despite our collective nostalgia for agrarianism, the history of agriculture has largely been one of exploitation and a product of professionalised science, privatised knowledge, and colonial and industrial extraction-based economies." "I head out the door, light of step, and onto the Golden Road. Strictly speaking, the name applies to a stretch that’s further to the north. However, in these touristic days, it’s often applied to the whole length of single-track carriageway that threads through the Bays of Harris. The tourists like to think it’s so named for spectacular sunrises that set the Minch ablaze. Local humour is less romantic. The only gold involved was the construction cost of hacking through the adamantine folds of metamorphic rock and bridging numerous little inlets." 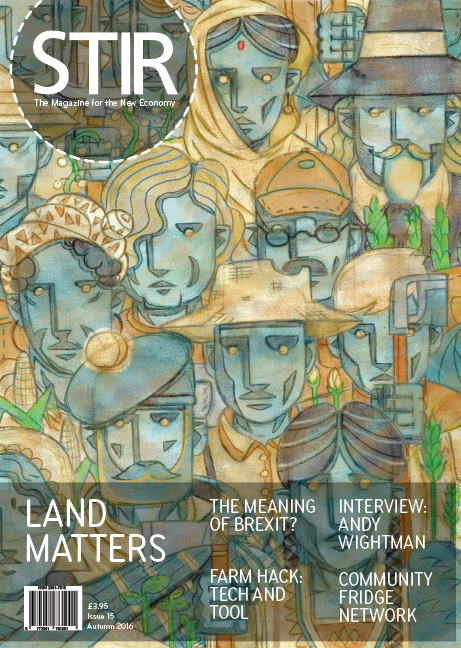 "Why has the Land Question been absent from politics for so long? Are Community buyouts making us rethink the importance of land? And is the housing crisis, affected significantly by increases in land value, making those in the cities realise that land matters again? Andy Wightman, a recently elected Green MSP, talks about these issues through his book The Poor Had No Lawyers: Who Owns Scotland?" "Is it possible to secure food justice in the United States when 94% of all farmland is owned by white people? When African Americans own less than 3 million acres of rural land today, compared to over 15 million acres just a century ago? I don’t think so." "Broadly speaking permaculture is about designing sustainable human settlements. Integrating ecology, organic husbandry, architecture, and landscape design, with the use of appropriate technologies, permaculture seeks to create systems in step with the natural world and its resources. Much of Mollison’s work drew upon the ideas of Masanobu Fukuoka, the farmer-philosopher, whose book The One-Straw Revolution laid out, with elegant simplicity, the case for no-till agriculture working with the grain of nature." "Wadi Fukin is a village of about 1,200 residents, made up of a few extended families from two hamoulas (clans) thought to have lived continuously in these central hills of Palestine for thousands of years. Village families share an ancient system of irrigation sourced from natural springs, whose water is collected into pools from which tunnels transport water to the vegetable plots on the wadi’s flat plains. The village recently lost several hundred acres of land to the expansion of nearby Israeli colony Beitar Illit." "Food waste is rising to jaw-dropping levels in the UK, with 15 million tonnes of food thrown away each year. And it’s not just the food industry at fault. Almost half of this waste comes from our homes. From common sense to commons sense, one town has a solution that might surprise you." "I am hopeful because when chefs, farmers and the general public are working co-operatively to make this happen we can see positive results. Positive for the consumer’s health through eating more locally produced food and positive for the farmer as they are selling their product and getting a good price when going direct to the consumer." "In Britain, over 20% of us are now considered obese, 40% of our food is imported (with serious implications for food security and sovereignty), youth unemployment is at 14.4% and social isolation is on the increase. What bright idea might offer a solution to these seemingly unrelated issues? The answer according to Colin Tudge, author of Six Steps Back to the Land, is a million more small scale farmers." "The world is on the move in record numbers. In 2015, more people—65.3 million of us—were driven from our homes by conflict and persecution than ever before. There seems no reason to believe this population churn has peaked, driven as it is by climate change and pressure on resources—though our media and politicians rarely frame it in those terms. We have to go deeper than the daily papers to discover, for instance, that the roots of Syria’s bloodbath include drought, crop failures, a rapidly falling water table and the consequent pressures of a desperate rural population moving to urban centres." Luke Carter is an illustrator and printmaker working primarily in linocut and other relief mediums. He enjoys working with political, social and historical subject matter. Thomas Hedger is a London based artist who utilises vectors to create bold flattened images, combining angular lines, softened curves and a vibrant colour palette. David Peter Kerr is an illustrator from Glasgow who would like to see new investment in democratically accountable municipal housing in Scotland and the rest of the UK. Graeme McGregor is a part-time illustrator and full-time human rights campaigner. Owain Kirby is a freelance illustrator working with the printmaking medium of linocut in colour and black & white. Alec Mezzetti is a graphic designer from Exeter, currently based in Leeds.